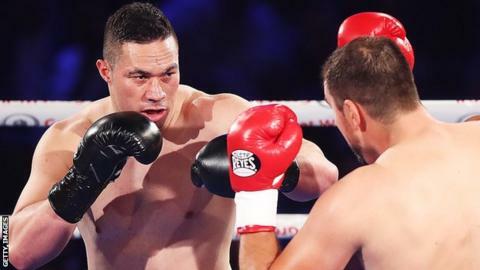 Joseph Parker defended his WBO heavyweight title for the first time in a drab points win over Razvan Cojanu. The New Zealand fighter failed to impress against the Romanian who took the bout at two weeks' notice, winning a 119-108 117-110 117-110 decision. The champion landed sporadic flurries throughout but never looked like scoring a stoppage in Auckland. He has said he will campaign overseas, with Britain's WBA and IBF champion Anthony Joshua a potential opponent. Though he remains unbeaten in 23 fights, the manner of this win may make Parker a tougher sell for pay-per-view audiences overseas. The 25-year-old - who claimed the vacant WBO belt against Andy Ruiz in December - did land some shots when in close to Cojanu but when at distance he looked incapable of finding ways to rock a man three inches taller and around two stone heavier. Cojanu, who now has 16 wins and three losses to his name, was one of Parker's sparring partners but stepped in to the main event when Britain's Hughie Fury withdrew through injury. Cojanu landed a left hook of his own in the 10th round and chased a stoppage win in the 12th. But, in truth, he always looked occupied with spoiling Parker's work, most notably when having a point deducted for leaning on the champion's neck in the fourth. Parker said afterwards: "You can all see why we bring Razvan into camp for us. He put on a great fight. "I've done my best to keep fights here in New Zealand but it's down to us to go and get some exposure overseas now."